Pure white blooms in early spring emerge on this vigorous, upright, compact evergreen shrub. Hardy, handsome, glossy green foliage take on a pleasant yellow fall color. The most recognized of all the white azalea. Use in foundation planting, a flowering screen in semi-shade, or in a naturalized setting. We offer Delaware Valley White 18" to 24" in a 5 gallon container. 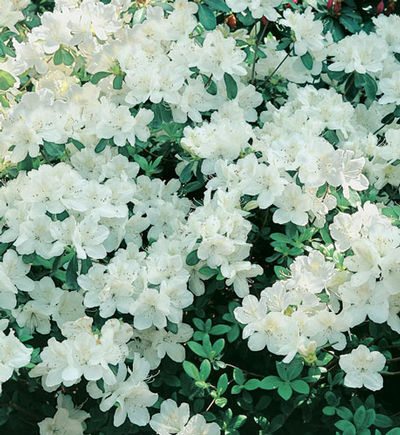 The most recognized of all white azaleas. Maintains a low growing habit. Single specimen, foundation or short border hedge. Excellent choice for a moon garden. Fertilize in the spring after blooming with a food for acid loving plants. For a formal sheared hedge planting 2 to 3 feet apart is recommended. When a natural hedge is prefered space 3 to 5 feet apart. Click on the "About Us" tab to find planting instructions.